When researching what type of auto paint you wish to purchase for your vehicle or motorcycle repainting project you will find there are a wide range of options available on the market ranging from different resin types (ie urethane, acrylic enamel, basecoat/clearcoat, single stage topcoat etc) to a countless number of colors. While it is easy to know a good color when you see one it is not always apparent what is the best type of paint to purchase. My goal with this post is to provide some background of the main options available so buyers can make an informed buying decision. This article is written with auto paint in particular in mind but we understand the uses of auto paint go well beyond just painting cars. However, the same logic applies for uses in decorative exterior applications of auto paint whether your painting a car, motorcycle, boat and the like. As a general rule, auto paint and motorcycle paint colors can be categorized as either “single stage” (aka mono-coat in some parts of the world) or “basecoat/clearcoat” (sometimes referred to as a multi stage finish). Single stage finishes are those that achieve both the final color and gloss with one product while a basecoat/clearcoat finish has a separate product to achieve color (the basecoat) and gloss (the clearcoat). While it may seem like a logical choice to use only one product to achieve both gloss and color, despite the added steps in a basecoat/clearcoat process, the fact is the a vast majority of all cars rolling off the assembly line today are finished with a basecoat/clearcoat process. Countless research efforts and proving ground trials by the major auto makers have proven that when done properly basecoat/clearcoat finishes demonstrate perfomance that justifies the added steps in their manufacturing operations. The resins and additives within basecoat formulations make it easier to apply and actually accentuates the appearance of effect colors such as pearl and metallic colors. Another key attribute of basecoat/clearcoat finishes is durability. Basecoat/Clearcoat systems tend to hold their gloss and “wet look” longer than single stage finishes which ultimately means less waxing and detailing in the future. Some people like to think of the clearcoat as a type of permanent wax. While some manufacturers had trouble with clearcoat peeling in the early years of basecoat/clearcoat finishes, they have since learned from their early mistakes and a peeling clearcoat is rare in today’s refinish market. One of the few downsides of the basecoat/clearcoat process is a slightly higher material cost in most cases. 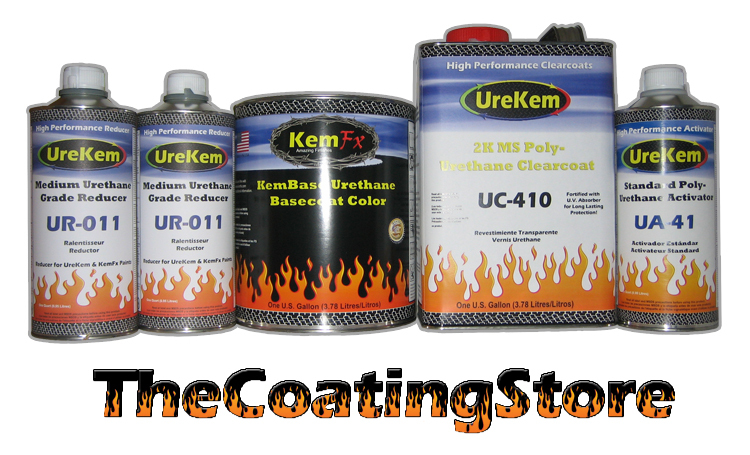 The added cost of the clearcoat layer versus a single stage finish is often easily offset by reduced maintenance cost (ie less waxing a detailing) and basecoat/clearcoat painted automobiles tend to hold resale value better than cars that were painted with single stage. Smart shoppers are finding deals online that make the investment for base clear kits less than many single stage finishes. With these advantages it is easy to see why the basecoat clearcoat continues to grow in the refinishing market while single stage use continues to decline overall.